All Participants must complete and sign a Waiver/Release of Liability and Player Registration Form. If the participant is under 18 then the form needs to be signed by their guardian - click here to download form. 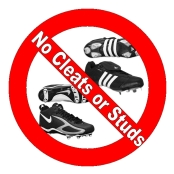 No spikes, or cleats are to be used on the turf… only turf shoes or sneakers allowed. Only players, coaches, and officials are permitted on the Playing Fields. No spectators are permitted on the Playing Fields. All children must be chaperoned by parent, guardian, or coach at all times. Please be aware and give way to athletes on the Track at all times. Do not enter the Training Area, Playing Fields, or Track unless permitted by a Danbury Sports Dome member of staff. No food, snacks, gum or candy are allowed on the fields. Water is the only liquid that is allowed to be consumed on the playing field or training area. No tobacco products allowed in the Dome at any time. No alcoholic beverages allowed anywhere on the Sports Dome’s grounds. You are responsible for placing all your trash and recyclables in the proper receptacles. No pets allowed inside the Sports Dome. Foul and abusive language will not be tolerated. Please help keep your Sports Dome clean.